Woodlands carved knives are quite rare. French-made trade blades were appropriated just as trade-made pipe tomahawks—the Woodlands people would haft them and make them their own with ornamental metal, bead, quillwork and carvings. The sheath would have had an attachment near the top to hang around the neck of a warrior. 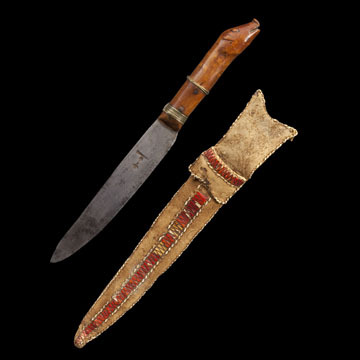 The knife’s handle is carved from a fruitwood in the form of a pig’s head. Though pigs were sometimes carved in the tradition of the Iroquois false-face, it is unexpected to find it here. Another rare pig effigy piece is the diminutive pig effigy ladle shown below.